Unlike coffee I’ve always enjoyed a nice cup of cha but I don’t think it was until I was away at Centre Parcs on one of our first proper family holidays that I really started exploring other varieties. From there it wasn’t long until I started getting various loose leaf teas, first from Twinnings and then I moved onto Whittards of Chelsea after discovering they had opened a store in the new shopping centre in town. I have to say I was pleasantly surprised at the difference in flavors between Twinnings and Whittards Earl Grey and now have a cup pretty much every day with breakfast, although I have now moved onto the Breakfast Earl Grey blend which is slightly stronger. As with the coffee I’m still re-discovering the flavors of tea having managed to cut out the sugar a few months ago now, it’s great being able to taste the drink for what it is rather then the sweetness of the sugar/sweetners I used before! Don’t worry, this isn’t going to be a post about useless bureaucracy, although I could easily fill a few paragraphs with such rants! I was a little apprehensive about applying the bar tape, having never done this before I had horrible visions of it all going terribly wrong and I’d end up with a horribly messy finish. Thankfully it all went quite well 🙂 After re-reading the recommendations in my bike maintenance book I started at the bottom of the drops and started wrapping the tape around the bars, overlapping by about a third each time and even managed to get round the brake levers and start on the tops before I realized I hadn’t quite gone round the brakes properly and so left a gap!! The other side went just as well and as I stood back to admire my latest bit of fettling I couldn’t help but feel rather proud at what a nice job I’d done for my first attempt, heck it might not be “perfect” but it’s my bike and I’m happy with it! The tape is red, it’s just appearing pink due to the flash on my phone firing 🙂 I haven’t had a chance to test ride with the new tape yet but initial inspection and tests of the various positions I’d ride in (namely on the hoods and on the drops) feel very cosy! During the week I couldn’t have had the hoods back on quite right as I’d been getting hand pains on the commute home so hopefully this should help and a comfy handlebar setup will be essential to the Magnificat! I finally popped my Embankment cherry proper last night. After contemplating it for a while I decided last night to give it a crack properly. My slap-dash research on BikeHike showed I’d be adding about 5 miles to my journey (or 50% which sounds much more impressive!) bring me to just shy of 15 miles. It was a pretty straightforward affair as I joined Upper Thames Street by London Bridge and then proceeded to race westbound, following the road beside the Thames. Gave the legs a good stretch heading through Blackfriars Tunnel on what is still familiar ground as I’ve ridden this section before! The guy was cetainly quick and I was now entering un-known territory and the section lovingly referred to as Death Star Canyon, a reference to the Death Star sequence in Star Wars where Luke is flying low through the narrow sections of the ship, as the buildings that suddenly appear around you have a similar effect. Not that I really noticed as my sights where firmly locked onto the red light of the bike ahead of me. I managed to get past but no sooner was I battling away in clean air then 2 roadies come past me with the same ferocity that I normally pass others! Looks like I’ve found me next prey – I immediately join on the pack of their train we have chug along at a healthy pace towards the queuing cars past Battersea Bridge. What happened for the next 3/4 mile can only be described as some death-defying filtering as the 3 of us made rather rapid progress through the traffic, weaving in and out of cars and avoiding wing mirrors by mere cm’s! I got caught out a few times by poor filtering choices which made it all the more fun as I just needed to put in a bit more effort to catch them! I spotted an opening in traffic as we passed Battersea Bridge and put the hammer down. I knew what was going to happen as for them, much like me, a cyclist passing is like a red rag to a bull! I held onto pole position until just before the road headed North. We all turned onto Kings Road and the action continued…..I did a frankly silly undertake on a Merc SL350 who was indicating left, to stay in touch and eventually parted ways as I turned down Wandsworth Bridge Road. The second rider was a complete ejit. Rather quick with a good turn of speed but at each set of lights we’d arrive at he’d RLJ. I’d then catch him and we’d do the same at the next set. The biggest surprise tho was that he was headed along an identical route to me! My competitive side wasn’t going to let this one go and consequently it meant a very decent pace for the rest of the ride home, with me leading for about 2 miles at one point! All in I can safely say that last nights commute was one of the best I’ve ever had, Embankment lived up to everything I’ve heard about it and the quality of riders was a gulf apart from what I’ve encountered on my normal routes – normally I might find 1 maybe 2 riders a month who’d require me to push myself like I did last night so to find 4 or 5 in one go was a welcome surprise! I think those 2 words pretty much sum up the odd experience I had whilst cycling in today, I was actually pretty glad it didn’t happen yesterday whilst I was climbing Succombs Hill or coming down Sanderstead Hill as the outcome could have been nasty!! It all started off with a rather odd clunk noise as I pulled away from one set of lights in Camberwell. I didn’t think to much of it at first as the bike often makes weird noises, mainly due to my rather sparse maintenance routine! The only difference this time was that it came from near my LH brake lever and not the bottom bracket. At the next set of lights I’ve once again gone to pull off and this time there was a definite snap noise and my LH STI unit sunk a bit……..oh crap this isn’t good!! I figured I could keep riding as long as I kept my left hand on the tops and just used the right hand for braking/gear change duty. Thankuly I only had about 3 miles left, but in those 3 miles I did have to tackle the double roundabouts at Elephant and Castle. Those from London will know these roundabouts can be a bit risky when you have handlebars that are joined together and both brakes so today I took them extra carefully! Luckily tho I was working with a very understanding colleague today who didnt mind me nipping out briefly to purchase a new set of bars and I managed to get them swapped over during my lunch break so I don’t have to get the train home tonight! All I need to do now is purchase some bar tape and learn how to apply that…..I can sense a few expletives being uttered!!! EDIT: Sorry it’s taken it while to get pics up – been rather lazy! Hmm, quite serious cracking there….. 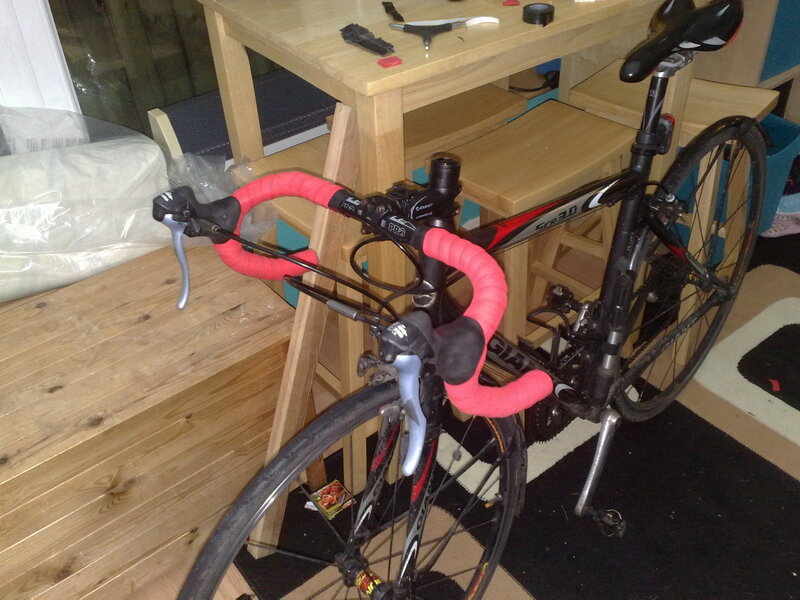 The completed repair, bar tape has been purchased and is still waiting to be applied! I want to go out for a ride tomorrow morning but can’t decide where to go! I’m not one for just pointing my bike down the road and seeing where I end up…..I need to ride with an aim, for a purpose. I know that just being out on my bike should be encouragement enough and I do love the feeling I get from just riding. As I didn’t get out for a ride last weekend due to the snowy weather I really feel I should do something worth while tomorrow. Part of me is thinking of heading straight out of Croydon down the A23 and to keep on going until I hit Redhill, then find the A25 and turn east and follow that along until Westerham before heading back up Croydon Road and home via Fairleigh. It’ll certainly be a decent amount of miles but I’m not sure if I just want to ride for distance…. Yet my “I want to challenge myself” side is wanting a shorter but all the more challenging route as make an attempt at riding up Succombs Hill, I say attempt as this particular one is sign-posted rather ominously as the bottom as a 25%! I drove up it once on a reccy and remember thinking the start was steep but then turning a corner was like hitting a brick wall as the road headed skyward! Yet I am still filled with a sense of fear and excitement at the idea of conquering this! It’s relatively short and I’ve done other short and sharp climbs as well as a few more drawn out efforts before. One of the group of cyclist that I went to Wales with took one look at me in the pub the first time we meet and said “You’d be great up hills!” I think my combination of diminutive stature, light weight and fairly strong legs make for a rather promising rider. I’d never fancied myself climbing much but it wasn’t until we visited Wales and I got my first crack at what I consider a proper climb that I realized what I could do. I did try looking on http://www.maymyride.com for some inspiration but I’m not sure if I’d get away with spending the whole day riding to Brighton and back and the other routes would be a bit sketchy as I don’t have maps for those areas! Finally this week has come to an end! Not only does that mean 2 days off work (but possibly only 1 off the bike!) it also brings to an end my stint at the closest site and so my shortest commute. I certainly had an rather fun commute this morning! Seems the snow overnight took everyone by surprise and what with the reported shortages of road grit this mornings ride in wasn’t the usual flying sprint that I usually muster! Once I got passed what I thought would be the hairer bits, namely the small railway bridge that was covered in slushy ice and the small block of tight turns in town I was greeted with pretty much clear (traffic-wise) slightly less slushy roads i the town centre which allowed me to make up *some* lost time. Ride home was just like a wet day, I really do hope this weather sorts itself out sooner rather then later – snow is great for the kids but can really ruin the fun of a commute on a road bike!